At Left. To improve the identification of tumor-specific neoantigens (red circles), Gritstone Oncology has developed EDGE, an artificial intelligence platform. 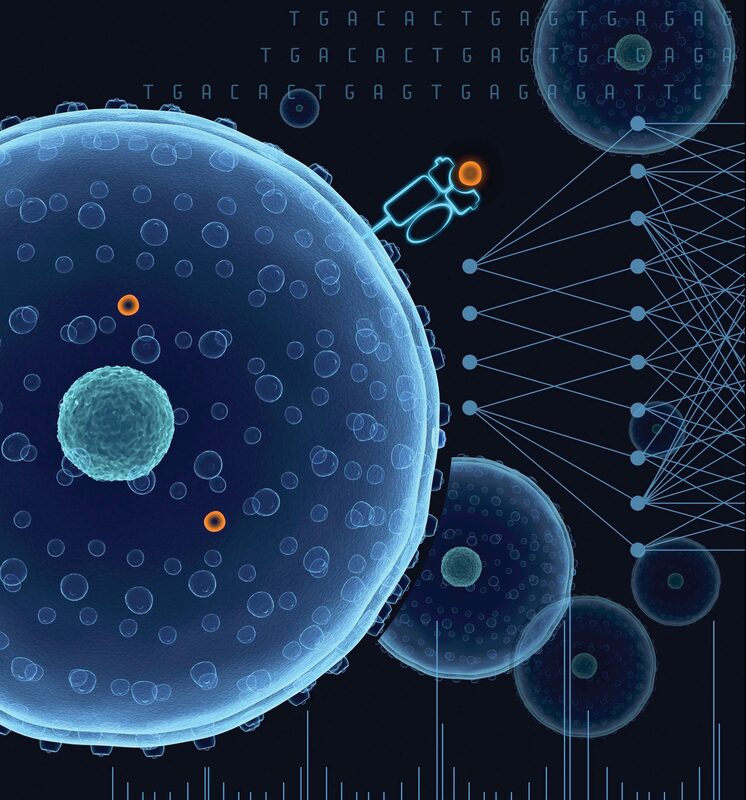 EDGE uses deep learning to analyze large human leukocyte antigen peptide datasets derived from mass spectrometry studies of human tumor samples. 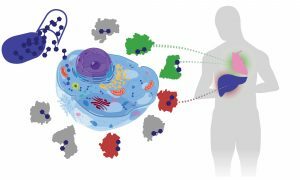 The company suggests that EDGE could help develop cancer immunotherapies that target neoantigens presented on tumor cells. Scientists face slim odds when trying to turn a molecule into a medicine. Most studies put the batting average at about 0.100—or 1 in 10. Some go a little higher, some a little lower, but the success rate for drug discovery is never “good.” Some scientists believe that the success rate could be improved if drug discovery were to apply artificial intelligence (AI), that is, if it were to use advanced computational tools such as machine learning (ML) and molecular dynamics simulation. Besides leading to more medicines, AI might even allow the creation of better medicines. Traditionally, a drug discovery project starts with basic research to uncover targets that may be susceptible to attack, such as a disease-related protein receptor on the surface of particular cells. Then, scientists use techniques like high-throughput screening to see which compounds bind the target. (These compounds can come from libraries of tens of thousands or even millions of molecules at large pharmaceutical companies.) After that, various methods of biological and chemical testing are used to fine-tune the structure or test other features, such as a compound’s ability to reach the target in an organism. To some extent, AI can be used in all these steps. Essentially, AI looks for patterns in data that can be used to sharpen predictions about which compounds will become medicines. Some AI-based tools are already being applied to discovering tomorrow’s medicines. It remains to be seen how ready the industry is for this transition. The missing information about what drives a biological system—healthy or diseased—explains why a compound often fails in Phase II or III trials. With better knowledge—created from applying AI to whole-genome, phenotypic, and clinical data—scientists will find better starting targets, Khalil believes, “because you’re learning it directly from the human population.” Then, by turning off specific genes to see what changes, scientists may get even more data to dump into computational models. Many techniques use AI like a black box: It finds patterns in the data, but no one knows what, if anything, they mean. Instead, Khalil prefers causal, or white box, AI. “We use it to get causality right from the beginning, and not just learn patterns,” she notes. To put so much data to work in the best ways, Khalil and her colleagues do in-house development and coding, and run the simulations with cloud computing, like Amazon Web Services. Other companies also use AI to see more in disease-related data. At Gritstone Oncology, chief technology officer Roman Yelensky, PhD, and his colleagues analyze cancer-created neoantigens, which are peptides (protein fragments) from cancer-mutated genes that can trigger an immune system attack on the tumor. The idea is that all of the mutations in a patient’s tumor can be analyzed, and then AI can determine which ones to attack. By analyzing data derived from analyses of more than one million peptides that had studded the surfaces of hundreds of tumors, Yelensky and his colleagues created a training dataset. Now, the company’s system can explore a person’s tumor for the top-20 candidate neoantigens to attack, out of 100–200 mutations. Building a cancer vaccine from 20 neoantigens is a balance, Yelensky explains: “With more neoantigens, you get more shots on goal, but you are using few enough to limit the odds of eliciting an irrelevant immune response.” The company is just starting a Phase I trial of this process, so the number 20 might change. Other scientists also explore the role of proteins in diseases. Pat Walters, PhD, senior vice president of computation at Relay Therapeutics, and his colleagues are refining a system that runs thousands of molecular simulations and uses ML as part of an effort to improve the drug discovery process. Computational analysis of these simulations tracks a variety of parameters, such as how much a small molecule moves in a protein binding site and the stability of intermolecular interactions. By comparing the trajectories of active and inactive ligands, the system learns to predict if a novel compound is likely to bind to a particular protein. According to Walters, the trickiest part is “capturing the fundamental physics and expressing that in a form that can be processed by a machine learning program.” So far, Walters admits that it’s too early to tell how much better Relay’s approach will be than the traditional drug discovery process. Machine learning may combine multiple parameters collected from a simulation to generate a model that distinguishes biochemically active from biochemically inactive molecules. In this example, provided by Relay Therapeutics, a machine learning program integrates the degree to which a small molecule moves in a protein binding site, the interactions between the protein and the small molecule, and the conformations of the protein. Examples of active and inactive molecules are used to train a predictive model that can be used to prioritize new molecules. Just because using AI in drug discovery sounds like a good idea doesn’t mean everyone will agree. The methods of discovering drugs at pharmaceutical companies are pretty traditional. Also, many of the processes are familiar to regulators. Given the penchant to stick to standard approaches, it will take some time to prove the value of AI in drug discovery. Cyclica has developed Ligand Express, a cloud-based, proteome-screening artificial intelligence platform that may be used to uncover a drug’s polypharmacology. A drug consists of many molecules that can enter human cells and interact with a multitude of proteins. Intended drug–protein interactions (green) have therapeutic potential, but off-target interactions (red) may cause unwanted side effects. By understanding off-target interactions sooner in the discovery process, scientists address safety issues more efficiently. One science and technology company that is ready is Merck KGaA. Although Klaus Urbahns, PhD, head of discovery and development technologies at the biopharma business of that company, points out that early AI-based projects didn’t always produce useful results, the technology is rapidly advancing and looks too promising to deny it further investment and exploration. In December 2018, Urbahns and his colleagues announced a licensing agreement to use Ligand Express, which is a computation tool for proteome screening from Cyclica. Urbahns hopes that the results will “predict how molecules would interact with human biology.” He sees the results fitting best with early-stage drug discovery. Ligand Express starts with a computational description of a small molecule, one with an atomic mass of just 200–900 Da. For comparison, aspirin is 180 Da. The format of the small molecule could be, for example, a simplified molecular-input line-entry (SMILE) string, which is a computer-friendly description of the molecule’s structure. Then, Ligand Express computes the list of targets likely to interact with this molecule, determines which interactions will turn the target on or off, and then links those reactions to downstream pathways to see how it might affect a person’s biology overall. Through a web-based interface, a scientist can organize the data to examine the targets or see how the targets of pathway might play a role in a specific disease. “Then, only the targets linked to your disease area and that interact with your small molecule show up,” Kurji explains. These processes depend on large databases and extensive computation—so large, in fact, that it used to take Cyclica about a month to screen 20–30 molecules against about 150,000 protein targets. Today, the deep learning tools from Cyclica can screen 10,000 molecules across the human proteome in less than two hours, Kurji says. Plus, this method shows scientists the interactions that are most likely to be on target, and weeds out most of the off-target effects. Out of all of the interactions indicated by the results, Kurji estimates, half of the top 60 will be true positives. “Compared to experimental results, that is equal, if not better,” he asserts. Mike May (mike@techtyper.com) is a freelance writer and editor.